The deception at this time of the year. Sticking together | A one-time “elected public servant” defending another.What the former state representative conveniently neglects to say is that while campaigning for office the current state representative is being paid by all the folks he represents — those who support him and those who do not. And the pay for a US Representative is $174,000 per year plus benefits. That’s a significantly higher chuck of change than the $50,000 the challenger is being paid. 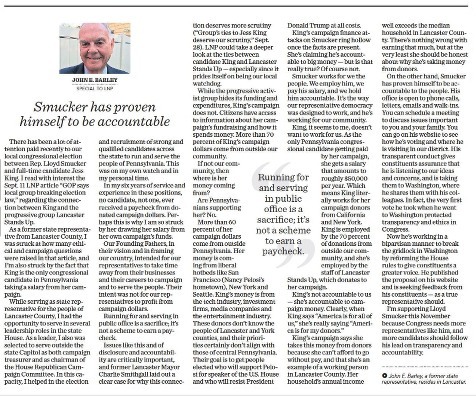 Today | there’s a response column in LNP – Always Lancaster. And the letter writer is not a career politician. It’s most curious how some elected public servants show up — we mean, really show up — right around election time.